I spend every workday bouncing between feeling like I just shotgunned a gallon of crack water and feeling like I need a month-long hibernation period (normally only about an hour apart). According to science, this isn’t a bipolar disorder, but simply the fact that I’ve been drinking coffee at the wrong times. 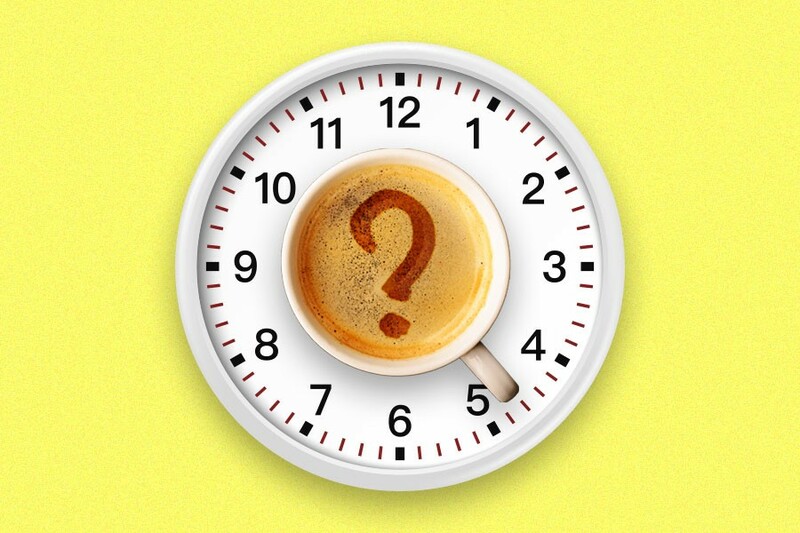 The best times to caffeinate, say the experts, have to do with cortisol levels (cortisol being the hormone that makes us feel alert and awake). Drinking coffee when cortisol levels are already naturally high encourages the body to produce excess cortisol, which increases your tolerance for caffeine and generates stress (elevated levels of cortisol promote anxiety). Drinking coffee when your cortisol levels are low, meanwhile, provides energy when you need it most and equalizes your mood without causing the jitters. Between 8 a.m. and 9 a.m. Between noon and 1 p.m. Between 5:30 p.m. and 6:30 p.m. Therefore, the best times to caffeinate for the average person aren’t first thing in the morning, but during the breaks between 9:30 a.m. to 11:30 a.m. and 1:30 p.m. to 5 p.m. That way, you take advantage of those cortisol level dips that would otherwise leave you feeling lethargic. Early birds (who wake up around 4 a.m.) can shift that schedule to caffeinate three hours earlier, and night owls (who wake up around 10 a.m.) can benefit from caffeinating three hours later. Finally, there’s also the question of how much coffee you should drink during these coffee breaks, which can be extremely difficult to figure out, since it depends on your personal tolerance for caffeine. Fortunately, the U.S. Army recently commissioned a study to develop an algorithm that provides users with the exact amount of caffeine they should consume (and when) for peak alertness. The algorithm works by accounting for your personal sleep schedule and administering several response time tests — more formally known as psychomotor vigilance tasks — to figure out how much caffeine your body requires to maximize alertness. While that technology is still largely in the works, a limited version is available as the 2B-Alert mobile app. If that’s too science-y, the Dietary Guidelines Advisory Committee says — as a general rule — that drinking three to five eight-ounce cups of coffee per day shouldn’t pose any problems for healthy adults. But again, your body maybe be better suited for more or less than that amount. Now excuse me while I enjoy another gallon drum of crack water.